Mayor Jim Watson announced the City of Ottawa's proposed Transportation Master Plan this morning, and the ambitious plan includes light-rail extensions to Baseline, Bayshore, and Place D'Orleans, plus conversion of the O-Train to light-rail before adding in new stations on the current line and then extending the whole thing to Bowesville -- all happening concurrently, all finished before 2023, at a price tag of about $2.5B. "We did not change the balance of investments towards transit and away from roads." That's maintained in the new TMP. Plan is to connect La Cite to the rail network. NOT waiting for provincial or federal contributions. Not sure what that entails. 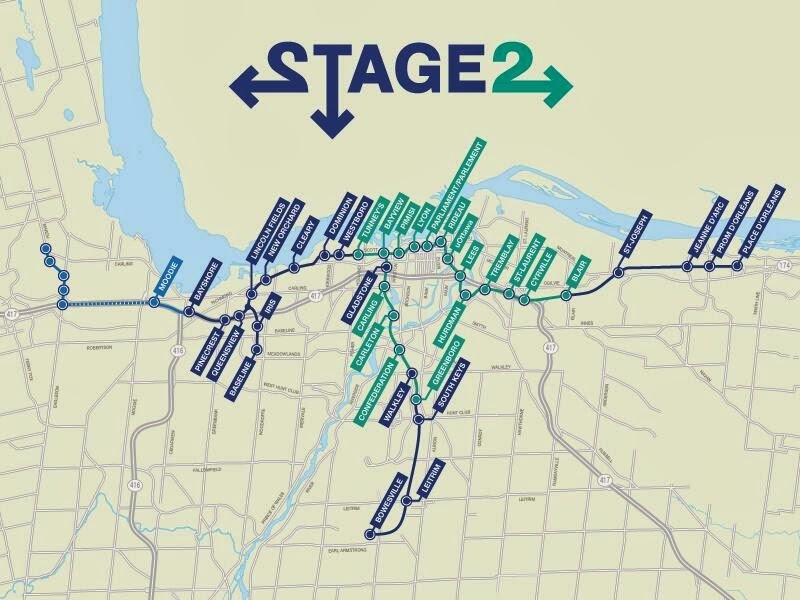 It could mean better bus service connecting to the Confederation Line, since the college is not considered within walking distance from either Cyrville or Blair Station. The new busways in the west are nothing new. Kanata North will likely see more reliable and less travel times for route 93 once the busway opens. These "new bus measures in the east along Blair" are probably for route 94. Innes was mentioned as one of the "transit priority" roads in the city's media release. The others are Montreal Road, Hunt Club Road, Carling Avenue, and Bank Street. Transit priority usually means an adjustment of the traffic lights to minimize delays to transit vehicles. Q about the Airport Parkway. I think JW said it’ll be twinned, but new lanes for HOV and cabs. For pedestrians, there'll be funding for pedestrian bridges, including the Somerset-Donald bridge. This benefits transit users in that area too because they'll now have access to either routes 16 or 18. So the western extension from Tunneys to Baseline, we've heard lots about. NCC still not completely on board, last I heard. Plenty of discussion about the Richmond Underground already. Plan is to skip the Transitway planned there. Go straight to rail on the planned route, including in the little tunnel. Line runs north along the Queensway past Leon's, etc. New ped overpass to Ikea (and, er, the Citizen). So, it appears the Pinecrest-Bayshore busway, where routes 93 and 96 travel, will be converted into light-rail. Interesting how there's an LRT extension to a rural area, but not to the airport. The additional ridership from the added stations and line extension can't be supported from the existing single track sections of the line. It would have to be expanded entirely to double-tracking eventually. The new stations in the south will take some pressure off buses on the south-east Transitway, which is likely the goal here. To the north, the Gladstone O-Train station is a welcome addition. And now to the east: new LRT stations at St-Joseph, Jeanne d'Arc, Orleans Drive, Place d'Orleans along the 174. Most of the 95 bus line will be replaced in the east end and Orleans Boulevard Station will be a new station since there isn't an existing BRT one at the moment. One thing to note is the rail line will extend through the Greenbelt on NCC land, which is not something the crown corporation will easily give up. Mayor says will expand rail to east, west and south "together." All this can be done for less than $2.5B, JW says. Rattles off numbers quickly. $500M to get to Orleans, for one thing. $100M for O-Train. Hard to imagine all rail extensions would be constructed simultaneously within ten years, given that both federal and provincial governments are experiencing enormous budget deficits. The draft outline of the Transportation Master Plan can be seen on the city's website and further details are to be released later this afternoon by the city. The plan will be debated at a Transit Commission meeting next week, and at a Transportation Commission and City Council meetings in November. Why Walkley is blue on the map? "Why Walkley is blue on the map?" Because a new O-Train station is proposed there. Same for Gladstone. The existing Walkley Transitway station remains as-is.